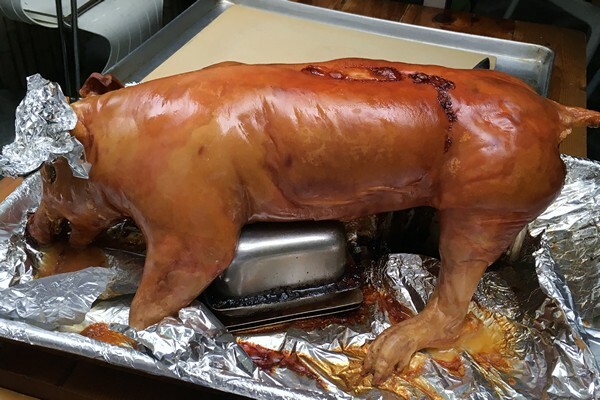 Possibly lechon is as traditional a July 4th dish as a hotdog. After all, the Philippines, where lechon, or roast suckling pig is the national dish, celebrated their independence (from the US) on July 4th. Our friend Zhu Zhu decided that a dinner featuring lechon, or roast suckling pig, would be the perfect way to celebrate the holiday weekend. We met at the Purple Yam in Brooklyn where a large table had been set up in the back garden. It was an eclectic, fun and hungry group as is usual with Zhu Zhu’s gatherings. Once everyone arrived, out came a beautifully golden brown pig. The chef/owner of Purple Yam, Romy Dorotan presided over the careful carving of the pig. He encouraged everyone to dig in while the pieces of skin were still crisp. 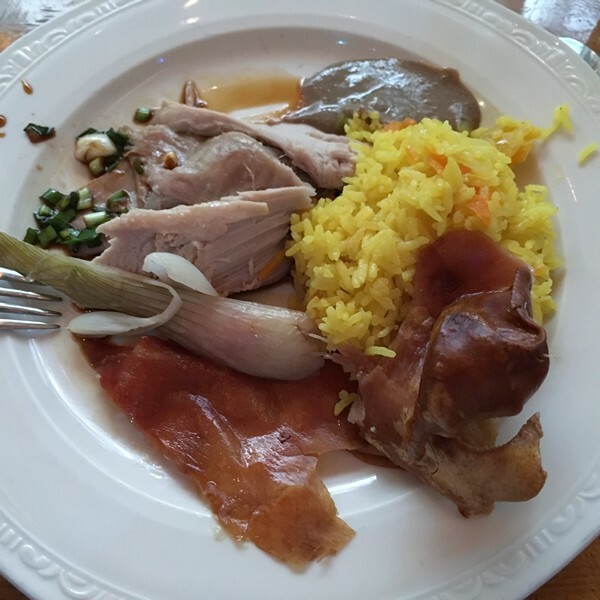 There was a big bowl of yellow rice and two sauces for the lechon. 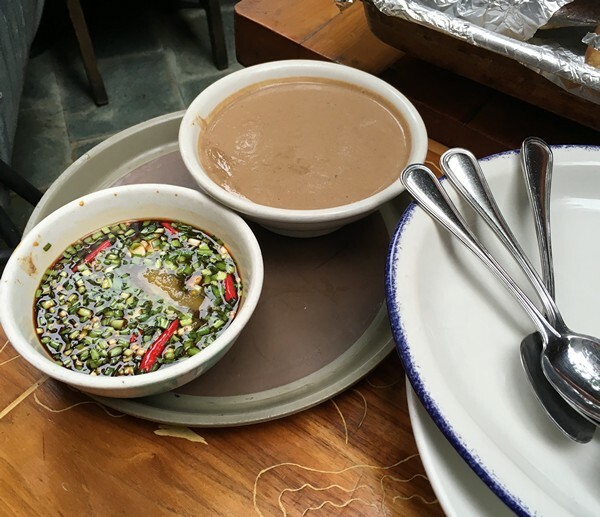 One was a liver sauce which uses the pig’s liver and bread crumbs. It’s rather like a thinned down pâte and went well with the pork. The other choice (and my preference) was a soy sauce with ginger and chiles. The skin was paper thin and crispy like a delicious potato chip. If you got a piece that had a little fat attached, it was heaven! I ended up with one of the ears, and feeling just a little guilty (it’s my dog’s favorite treat), gave it a try. All I can say was that it was great-more crunchy skin! The Accidental Locavore has never had lechon before, so I have nothing to compare it to, but this pig was perfectly spiced, the meat had great flavor and was so tender it melted in your mouth. A high standard for future lechon and definitely worth a trip to Brooklyn! As I was writing this, I wondered–lechon is the national dish of the Philippines, then what is the national dish of the US? Google it and you’ll find it’s…nothing. What would be your choice for our national dish?